This course teaches students how to plan, compose, and execute effective business documents according to current professional standards. The course emphasizes considerations of purpose, audience, organization, and style, and provides both broad guidelines for composition and targeted strategies for specific kinds of documents. Special attention is also given to the collection and analysis of data for use in reports and presentations. English 102 is designed to give students both a conceptual understanding of what is important in various genres of business writing and the ability to competently execute documents in those genres. By the end of the course, students should be able to provide intelligent explications of strategies for business communication in a wide range of areas; they should also be able to employ those strategies in their writing. 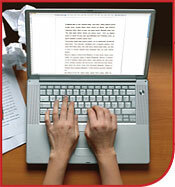 Explain the centrality of clear and efficient writing in today's business environment and the major obstacles therein. Adjust sentence style to improve clarity, determination, and emphasis. Balance sentence length and rhythm over the course of a paragraph. Create smooth, varied transitions between sentences and paragraphs. Employ gender-neutral language according to current workplace standards. Perform accurate audience analyses and correlate them with specific purposes. Create coherent outlines, and apply a range of other organizational techniques. Distinguish between routine and non-routine communications and between direct and indirect organizational plans. Compose effective titles and closings for a range of business documents. Discuss and apply strategies for motivation and persuasion, and apply them to sales letters, claims, and proposals. Successfully buffer and deliver bad news in adjustment letters and evaluations. Responsibly gather data from both primary and secondary sources, and analyze that data. Create successful tables and charts, and perform cross-tabulation analyses. Plan and execute periodic reports, project proposals, and research proposals. Plan and execute written and oral presentations. Write reports and presentations collaboratively. Compose effective resumés and letters of application.